caldera: a cauldron-like volcanic feature usually formed by the collapse of land following a volcanic eruption such as the one at Yellowstone National Park. The Bruneau-Jarbidge caldera is located in present-day southwest Idaho. The volcano erupted between ten and twelve million years ago, spreading a thick blanket of ash in the Bruneau-Jarbidge event and forming a caldera. Animals were suffocated and burned in pyroclastic flows within a hundred miles of the event, and died of slow suffocation and starvation as far as 1000 miles downwind in northeastern Nebraska, where a foot of ash was deposited. At the time, the caldera was above the Yellowstone hotspot. The Jarbidge & Bruneau Canyons are another one of those places that I have visited and wanted to rush back to. The window for the trip is usually small and is during peak snow melt. 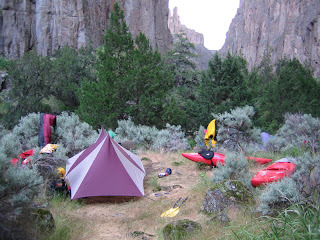 Just before heading out to the Upper Clackamas Whitewater Festival I received an invite from Boise local Brian Ward to spend 3 days in the Jarbidge & Bruneau canyons. 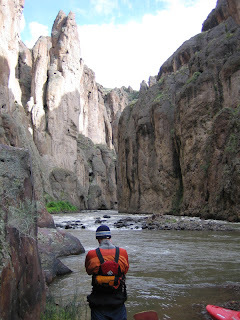 I had been there once before and couldn’t resist going back since Brian had dialed in the flow window and we were looking at putting on with 1,200cfs in the Bruneau and rising to over 1,600cfs on our last day in the canyon. The put in for this run is at Jarbidge forks where the east and west Jarbidge come together, only 80+ miles and two hours from our take out/meeting area. Our crew of 5 put on around 1pm and quickly made downstream progress on the swollen river. About 8 miles into the run the scenery is spectacular with spires and hoodoos lining the tall canyon walls and Juniper Cedars lining the river banks. The whitewater never goes beyond class III until around mile 17 where the river drains through Sevy Falls. Sevy and Jarbidge Falls are the two most common portages on the Jarbidge due to the trashy land slide nature..
Below Sevy we paddled a few more miles to our first camp at Cougar Creek. 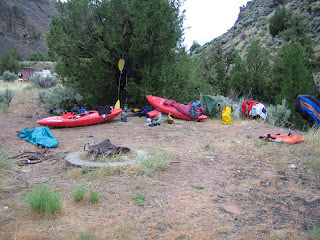 This camp site offers great sleeping areas by the water as well as a 3 mile hike up Cougar Creek to Arch Canyon. I had dinner and promptly went to sleep still trying to recover from a few days of travel. The next morning we had a little more water in the river and took our time leaving camp. A few miles below camp we encountered Wally’s Wallow, the first class IV of the day. Like most of the bigger rapids on the Jarbidge it consists of a few large boulders blocking your view of the middle of the river. And like most of the rapids here you can scout on ether side of the river. Wally’s went well for everyone and we continued downstream through more fun class III-IV rapids until we reached Jarbidge Falls. This landslide rapid had way more water than my previous trip and looked much better for taking a kayak down it, the sieves were covered! The tricky part was catching the eddy on river left above the drop, at this flow it was a small one boat eddy moving fast into the entry rapid. Most of us ran Jarbidge with various results and made our way downstream to a shady tree. After a lunch stop we paddled into the Buneau river stopping briefly at the Indian Hot Springs and then continuing through the canyon. The Bruneau canyon is equally as impressive as the Jarbidge and on a slightly bigger scale. After all, that is what most of this trip is about, scenery, and just being out there. draw: a small, natural drainageway with a shallow bed; gully. We paddled about 9 more miles hoping to stop for camp at Cave Draw however it was comfortably taken so we continued down another mile to the next draw on river right. Once again I fell asleep fast watching the sun drop past the canyon rim. The depth of the canyon makes it really tough to tell what time of the day it is, it stays dark in there most of the day is some places. Day 3 we had 30+ miles to paddle, a 4 hour (which turned into a 6 hour) shuttle to run and a 8 hour drive back home. Out of camp we paddled about 12 miles before stopping to take a break. The Bruneau was now running at 1,600 cfs and pushing us through the canyons walls with impressive speed. We paddled another 11 miles and charged into five mile rapids before we knew it. 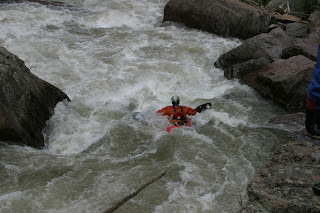 The next 6-8 miles was great read and run class III+ – IV open whitewater. The sight of Wild Borrow marked our last rapid and 3 more miles of moving current to the take out. We rushed our way through the canyon based on our time limit, but one could easily spent weeks in that 70 miles stretch just checking out the canyon. I think if this place was little more accessible to the average person it would be on the list of National parks however you have to put on the river, or fly directly over it, just to get a glimpse of what is down in the canyon. Facts: 70+ mile Desert Canyon Run in South West Idaho. 2 hour shuttle (one way) on mostly gravel roads. Flows: Check the Bruneau River gauge for flows: We had 1,200 rising to 1,600 with more water in the Jarbidge than the WF Bruneau. Hazards: Shifting wood, Jarbidge Falls, Poison Oak/Ivy, Limited access to the canyon for miles, Dangerous diversion dam just below the take out! 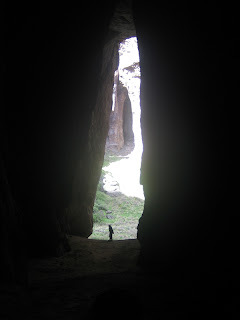 Fun Facts: Multi day self-support in a deep canyon in Idaho! Directions: Stop by Idaho River Sports for maps and guide books of the area before heading into the Idaho back roads. Take Out: 8.5 miles southeast from the town of Bruneau above the diversion dams. All boaters must carry a U.S. Coast Guard approved personal floatation device (PFD) and be prepared to wear it for the duration of the trip. 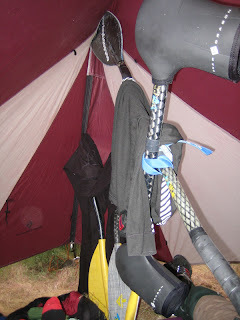 Leave no trace and pack out everything that you pack in. Leakproof portable toilet units are required. All human and dog waste must be carried out and disposed of properly. Boaters may encounter Native American artifacts such as petroglyphs on the rock faces along the river. Don’t disturb these reminders of the past. Vandalism of these historical objects is punishable under federal law.